This is a maintenance update of the FamilyGames.com freeware game Hierophant. Changes include fine-tuning of the installer and minor cosmetic tweaks. Download Hierophant. After downloading, open the file to install the game. 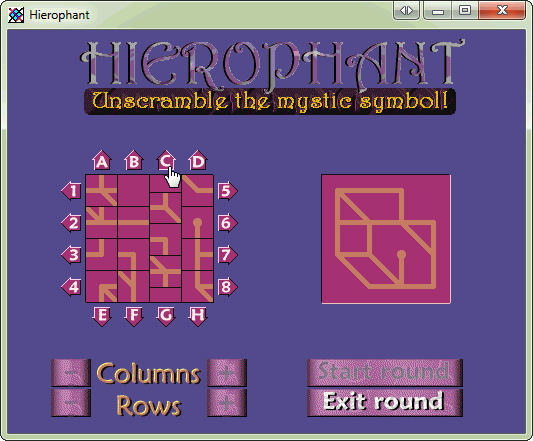 For those who don’t know Hierophant, it is a simple 2-D game, generally reminiscent of a 4×4 tile puzzle. Unlike the usual toy version, however, there is no missing tile. Instead, movement is permitted by having the rows and columns wrap around. The object of Hierophant is to restore a randomly-generated ‘mystic symbol’. This maintenance release (3.3.5.1) corrects a bug triggered by specifying a custom quiz length greater than 36. Thanks to NoteCard user Zoltán Farkas for identifying and reporting the bug. It seem that there are lots of folks who still like to have our Christmas Trivia Screen Saver running on some screen around the house during the holiday season, and we’re happy to continue to provide it as a free treat for Windows users. For several years, however, the screen saver has been in need of an overhaul to correct a number of small problems that cropped up with the release of successive versions of Windows. Now those problems have been addressed, and a new version of the screen saver is available for download effective immediately. If you already have the screen saver installed, we recommend that you explicitly uninstall it before installing. Please note that this release applies only to Windows XP, Windows Vista and Windows 7. 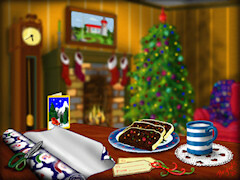 The main action in the Christmas Trivia Screen Saver is a quietly animated fireside scene with a flickering fire, twinkling Christmas lights, and a working grandfather clock. In the foreground is a table with a snack set out for Santa, though it’s not he who finds it and starts to nibble. 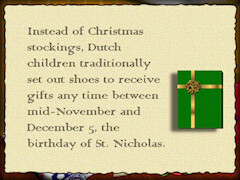 Every now and then, a page of easy-to-read text reveals a Christmas fact you probably didn’t know unless you hang around our trivia site at Christmas time. With sixty different pages to view, there are plenty of fascinating nuggets to keep you entertained throughout the season. MIDI renderings of fifteen Christmas carol arrangements provide an uninterrupted soundtrack if desired. Settings to control the music, the frequency of the Christmas trivia, and more options are available through Windows’ display customization controls (see this PDF read-me file, also included in the download, for more details). Download the screen saver. After downloading, open the file to install the software. We hope you enjoy this screen saver, and we’d be delighted if you make it part of your end-of-year celebrations this year. This is the first public release of NoteCard 3.3. The download and buy links on the AheadWithMusic.com home page and elsewhere on our site have been updated to refer to this new version. Undoubtedly the most striking new feature in NoteCard 3.3 is an ear-training mode for quizzes. 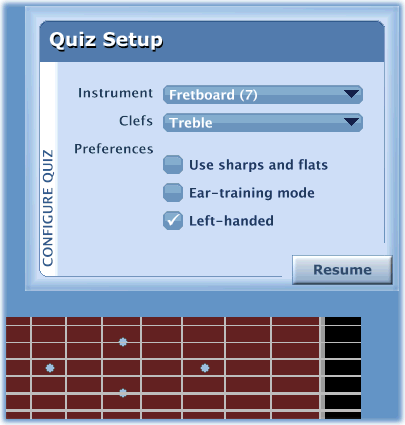 In this mode, instead of each note being simultaneously played back and displayed on the staff during quizzes, the display of the written note is withheld until after you have entered your guess by ‘playing’ the note on your chosen input instrument. You must rely wholly on your ear, and in particular on its ability to identify the interval — the distance in pitch — between notes heard in succession. The musical ear takes longer to develop than the musical eye. You should soon be fully versed in note-reading, with NoteCard’s help. However, you are likely to find that your ear training progress (indicated as usual by the percentage score in the Progress Gauge) has lagged well behind. There’s a simple reason for this: it’s harder. We recommend starting very gradually, with a single treble or bass staff (not both together), and without the sharps and flats option until your progress rating is near 100. Note that since the ear-training feature relies on MIDI playback, it is available only in Paid Mode. This means that to use it you must have bought your copy of NoteCard or be still in the 10-day evaluation period. NoteCard 3.2 added an on-screen control for adjusting the speed of response required in quizzes. Now NoteCard 3.3 provides a parallel control for setting the length of each quiz — the number of notes you will be asked to identify. Both controls now support a ‘custom’ option that is governed by a value in the NoteCard settings file. Look up ‘settings file’ in the index of NoteCard’s help file for details on using the new and revised settings. We hope you enjoy using NoteCard 3.3 and find it of value in your musical studies. This is the first public release of NoteCard 3.2. The download and buy links on the AheadWithMusic.com home page and elsewhere on our site have been updated to refer to this new version. NoteCard 3.2 builds on the MIDI input capability added in NoteCard 3.1, with improved reliability and an octave transposition control in the MIDI Setup task. We’ve added some other features requested by users: a wider version of the 4-octave piano keyboard control so that the keys are easier to hit; and a speed control (slow, medium and fast) for quizzes. In general, low scores in NoteCard shouldn’t be a cause for dismay. With a little practice, they will soon go up. However, some students may find their initial low scores discouraging; they may find it more congenial to use one of the slower quiz settings. However, the goal for all students is as always to achieve perfect scores at the highest speed, so the use of the lower speeds should always be viewed as temporary. The speed rating does not affect the computation of the overall progress rating, which should be 99 or more before the student is ready to “graduate”. Also new in v3.1 is a more efficient ordering set-up that provides for a quick license code purchase from within the program, together with full RegNow tracking support for sales affiliates. This new release of our Christmas game for ages 3-7 is an incremental upgrade to address a couple of long-outstanding issues. This is the first public release of NoteCard 3.1. The download and buy links on the AheadWithMusic.com home page and elsewhere on our site have been updated to refer to this new version. NoteCard 3.1 adds a feature (in Paid Mode only) that didn’t quite make the cut for 3.0: the capability of using an external MIDI instrument to enter notes into the program. This should be particularly useful in group teaching situations where each student is equipped with a keyboard, as well as for private users who have a MIDI keyboard as part of their computing configuration. Starting now, the first public release of NoteCard v3.0 is available for download on our website, and for sale through our payment processor, RegNow. See the download and buy links on the AheadWithMusic.com home page and elsewhere. Several minor bugs have been fixed in this version relative to the recent internal release candidate. In particular, some user account issues arising from switching between Free and Paid modes were addressed.